May 2018 making it the warmest May in the UK in a series of records stretching back to 1910. From Denmark to Sweden and Norway, May 2018 was historic too. The Mediterranean, however, which is usually warm in May was cool and wet. Warm and sunshine records were smashed for May in the UK, Western Europe and Scandinavia as the area enjoyed many warm dry days with many areas enjoying tropical temperatures for days on end after a chilly start to the month. The Dutch Met Office KNMI claimed May 2018 was the warmest month of May in three centuries, it was the warmest May since 1706 with almost half the month recording days of 25 deg C, (77 deg F) the highest number since 1901. The UK Met Office claimed increased sunshine during May 2018 helped to make it a record-breaking May for daily maximum temperature and sunshine across the UK. The provisional average daily maximum temperature was 17.0 °C during May 2018 making it the warmest May in the UK in a series of records stretching back to 1910. With 245.3 hours of sunshine, May 2018 was also the sunniest May with the record stretching back to 1929. Tim Legg, of the Met Office National Climate Information Centre, said: “Increased sunshine during the month has helped to keep daytime temperatures high, leading to it being the warmest May since records began in 1910. Records of warmth and sunshine in Sweden, Denmark and Norway too. From Denmark to Sweden and Norway, May 2018 was historic. 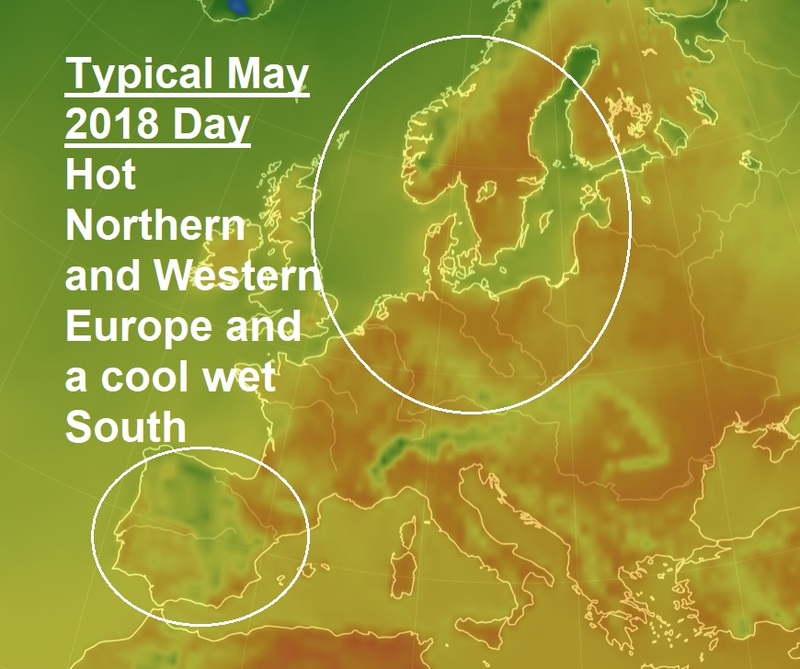 In Denmark, it was the sunniest and hottest May in the country since records began, with a monthly temperature deviation of 4.2 degrees (average temperature of 15.0 ° C). The capital city of Copenhagen registered a maximum temperature of 29.3 ° C (84.7 deg F) on 30 May, smashing the monthly record of 1886 (28.5 ° C). In Norway, the threshold of 30 ° C (86 deg F) was regularly exceeded and a new monthly national record was set at Etne (32.7 ° C, 91 deg F, the previous record of 31.8 ° C at the end of May 2017). Monthly records were also reported in Bergen and Oslo, with average monthly peak temperatures reaching 22.5 ° C, far ahead of a 70-year-old record (21.1 ° C in 1947). New monthly records were also shattered in Sweden, such as in Gothenburg (31.1 ° C on 30 May). The Mediterranean, however, which is usually warm in May was often less sunny. For example, in May the average maximum temperature in Biarritz was 4 degrees lower than in Oslo, and that in Toulouse was 2 degrees cooler. At the Luc (Var) station, the monthly sunshine was the lowest since records began, (35% of the deficit) with only 178 hours.